The term “Rosie the Riveter” was first used in 1942 in a song of the same name written by Redd Evans and John Jacob Loeb. It was recorded by numerous artists, and it became a national hit. Their inspiration for the song was Rosalind P. Walter, who “came from old money and worked on the night shift building the F4U Corsair fighter.” Later, Rose Will Monroe worked as a riveter at the Willow Run Aircraft Factory in Ypsilanti, Michigan, building B-24 bombers for the U.S. Army Air Forces. Monroe was asked to star in a promotional film about the war effort at home, and Monroe happened to fit the description of the worker depicted in the song. The poster — click to see larger. Then the May 29, 1943, issue of the Saturday Evening Post depicts a muscular woman in overalls taking her lunch break; the name “Rosie” is visible on her lunchbox. In 1942, the Westinghouse Company’s War Production Coordinating Committee hired Pittsburgh artist J. Howard Miller to create a series of posters to promote Westinghouse worker morale. 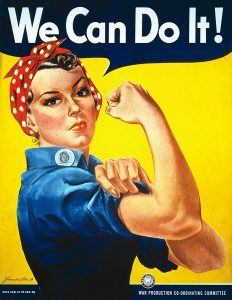 One of these posters, titled “We Can Do It!”, celebrated women in the war effort workforce; it was meant only to be used briefly in the company’s own factories, and only about a thousand were printed. A copy was found in the National Archives in the early 1980s (and so far, only one other original has been found). It was never called “Rosie the Riveter” when it was used, but it put a new face on that meme, in part because the Rockwell painting was copyrighted, and thus couldn’t be widely used. The Miller poster became what is now widely thought of as “the” Rosie. The original newspaper photo from 1942, showing Miss Parker. 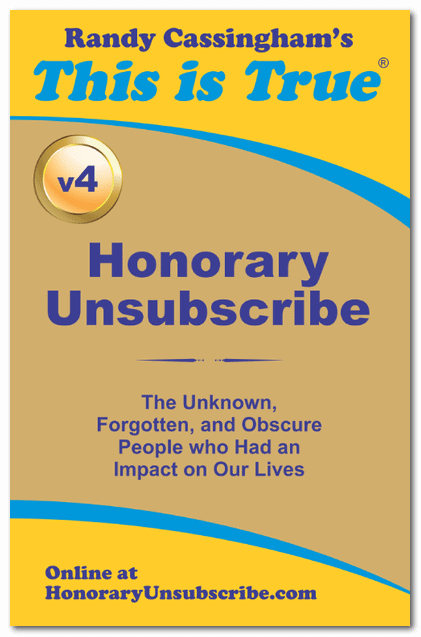 Again, click to see larger. But who was Miller’s model? She was widely but erroneously reported as being Michigan war worker Geraldine Hoff Doyle — no relation to Mary Doyle, who had posed for Rockwell’s “Rosie” painting. Many women came forward to say they were the model, but James J. Kimble decided to answer the question for sure. 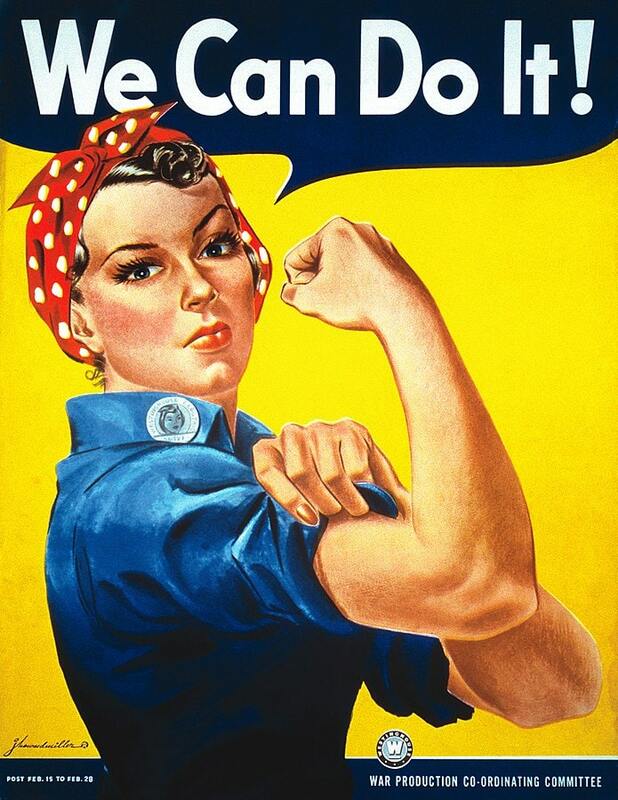 “It turns out that almost everything we think about Rosie the Riveter is wrong,” Kimble said. “Wrong. Wrong. Wrong. Wrong. Wrong.” For him, in 2010 the identity of the poster model became “an obsession,” and he found the original news photograph the Westinghouse poster was based on — right down to the polka-dot bandanna holding back her hair. He finally found a copy of the photo in a shop selling antique photos: it noted it was taken on March 24, 1942 — in Alameda, Calif. The caption: “Pretty Naomi Parker looks like she might catch her nose in the turret lathe she is operating.” Dr. Kimbal tracked the girl down. Naomi Parker Fraley told him she and her younger sister had gone to work at the Naval Air Station in Alameda after the attack on Pearl Harbor brought the U.S. into the war. She was 20 at the time. 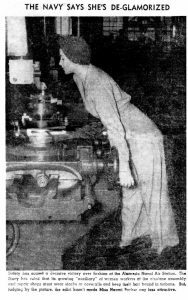 “I would say there is no question that she is the ‘lathe woman’ in the photograph,” Kimble says. Fraley already knew: she had seen the poster at a reunion of women war workers, saw the resemblance to the news photograph, which she still had, and she chafed at the incorrect identity printed under the poster: Geraldine Doyle. “I didn’t want fame or fortune,” she said, “but I did want my own identity.” Fraley is now widely accepted as the model for the poster “Rosie” — which was never titled with that name. She worked as a waitress, had a family, and enjoyed the correction of the identity of the poster model: “Victory! Victory! Victory!” she told a reporter in June 2016. She died January 20, at 96.